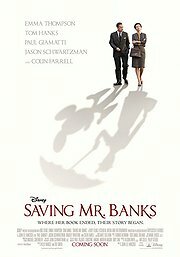 This film works much better if you are familiar with the Mary Poppins film of 1964 the genesis of which it describes, and even more fun if you read up on the complicated history of that film and the problematic characters of both Walt Disney (Tom Hanks) and P.L. Travers (Emma Thompson) at the heart of it. I have not seen Mary Poppins in about 30 years, I would say, and only know a little bit about fighting about the production. But still, to my surprise, it worked for me as a piece of slightly cheesy entertainment, pressing some of the right buttons. The back story of the mostly misogynistic children’s book author was presented to provide an interpretation of where she comes from and why she is the twisted person that she appears to be. Hollywood serves as a backdrop of absurd theatre as well as of somehow ruthless capitalism, albeit somehow charmingly so (you have to give them that they are rather enthusiastic about what they are doing). There are some foot-tapping-inducing bits of music from Mary Poppins, some tear-inducing scenes of families breaking apart, and it would not be a proper Hollywood-Disney film would there not be a finale that provides closure and an upbeat note for everybody. All a bit of a lie, really, but who cares in a film about a film about flying nannies and dancing penguins? Revisiting Mary Poppins is lined up, and now I am actually looking forward to seeing it again at last.